necrotizing fasciitis? what is that? it's like some bacteria liquefied the whole thigh! I love making 11,232 dollars more base pay as a night shifter...that, and not having certain nuisances breathing over my neck! Hi everyone! I hope you are having a wonderful day wherever you are. I would like to know if you can recommend any nursing magazines or continuing education websites for a brand new nurse. I am so excited to learn as much as I can. 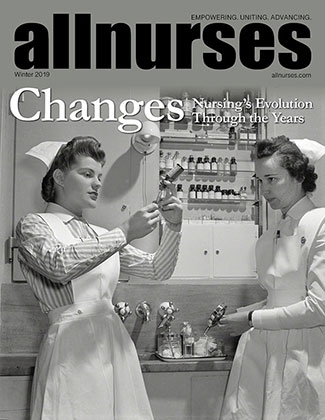 Maybe you can recommend a magazine to subscribe to or a great place to earn CE credits that helped you a lot on your first year of nursing. Thank you so much! Thanks to everyone who responded! I certainly learned a lot and will apply a lot of the lessons for my future patients! Another preceptor just told me the other night, "Always keep that vitality, sense of urgency, and purity as a new grad. Don't end up being like some nurses here that mirror misery on people around them." Thanks for all the replies so far. I definitely went into this profession with an open heart and open mind. I've run into a handful of jaded nurses and I don't want to end up like that. As far as the above post, I did try that angle as well and I will always keep trying with all my future patients. I know this disease is terrible and debilitating and pain can make a lot of us act in crazy ways, but the reason I posted the question is because I was seeing a pattern. Hi everyone, So just a little background...just like the name says, I am a brand new nurse. Where I went to school and did my clinicals was a part of the country that didn't have much diversity, so I never ran into patients with Sickle Cell. Where I work now is a very busy, inner city teaching hospital with an abundance of patients with this diagnosis. So anyway, after getting report for my sickle cell patients, I asked the reporting nurse and my preceptor for any tips or words of wisdom on how to provide the best care for my sickle cell patients. Their answers were, "Oh, you'll see. You'll learn quick..." They weren't kidding. I am not trying to categorize sickle cell patients, but the ones I've had are by far the worst, rudest, and ill-natured people I have ever run into in the health care setting. For example, we have patient X who is an addict. This patient has a high dosage IV Dilaudid ordered PRN for pain every 3 hours and she has an alarm going off telling him/her when he/she is due. Patient is so rude to the nurses and aides. She gets her meds on time every time but complains about every thing and tries to get the staff pitted against each other with manipulation and lies. Patient X also keeps messing with her central line and being non-compliant with the plan of care. Patient Z is the same exact way, just add more cursing and attitude. Mind you, these patients are constantly on their phone and computers showing no outward signs of pain, no change in VS to signal pain, no anxiety, normal labs (minus what is expected for sickle cell). Patient Z goes as far as messing with her IV pump and changing drip settings and trying to be slick by stealing syringes and needles if he/she thinks the nurse is not watching him/her like a hawk. Both these patients are suspected of doing something with their central lines because they both have problems with them. If you ask any of the nurses, they all say the same thing. I feel terrible that the sickle patients are under this predetermined category in this setting, but they all seem to put themselves there.....rude, drug-seeking, addicts, manipulators, non-compliant, liars. The ones I have had will not hear you out no matter what angle you use. It's like their dx gives them an excuse to be horrible human beings... What has your experience been? I know these patients are sick and in pain, but why act like nightmare people or nightmare patients? Need Your Wisdom and Experience please! Hi everyone, I'm a new grad nurse and I just started a job in a big name teaching hospital on a very busy med-surg floor about a month ago. I like it a lot but I honestly don't love it. However, I do everything with a smile and with a sense of urgency. I've never worked in a busier place in my whole life. This place is like a factory with the swarms of doctors and their orders and the influx of patients. I thought I was doing a bad job, but apparently some people think I'm doing great and I actually got asked if I was interested in doing Tele. I've been able to progress pretty rapidly and smoothly. Please help me get it! I have a test to take in a couple days and I really want this opportunity. What are the things I can expect on this test? What meds are likely to be on it? What are some nursing interventions I should know? Please help me wise and experienced nurses. I started reviewing strips and my ACLS stuff. I'm kind of freaking out but I'm determined to pass that test. I'm really grateful to have a job as a new grad in this med-surg unit, but I think my style and personality as a nurse would make me a better fit in a critical care unit. This hospital is known in the country for hearts. It would be amazing to be a part of that. Thanks so much! I really appreciate all the advice, tips, wisdom you can offer. How to deal with Negative Nancys?! Greetings everyone! First, I just want to thank this site for all the good that it does. I've finally joined but for quite a while now, I've been enjoying the posts and discussions on this site. I wish I knew about this site earlier because it could have helped me out tremendously in nursing school. Well, I'm a brand new nurse as the name says. I recently got a job in a very busy med-surg unit. It's been scary and exciting and fun---just a mixed ball of emotions! I'm learning tons and I've begun taking on more and more patients. I've been set up with some wonderful preceptors and supervisors. I also like most of my new hire cohorts (for the most part). While having this opportunity has been quite a blessing, not everything is great. I've run into a handful of nurses and aides that have really bad attitudes or just walk around all day like they hate their jobs. I greet everyone and try to be conversational but some of them just seem to be very cliquey or hate their lives. Some have been the opposite and introduce themselves and say something like, "If there's any way I can help you, don't hesitate to ask." I really appreciate those nurses. I'm sure this situation doesn't just exist in nursing, but this is my first real job and I've never encountered so many people in a place of work that seem like they hate being where they are. Some of them have been in the unit for years and what I don't understand is if they are unhappy, why stay and be stressed out or be jaded? I guess my question is not necessarily how to deal with Negative Nancys. The easy answer is to befriend the ones that aren't. How do I avoid becoming the nurse that no one wants? How did you deal with negativity and bad morale in your place of work? Thanks for your help!